For Parshas Kedoshim. Caution, for those who are already keeping sefirah - digitally mastered instrumental and vocal music! I saw a discussion in the Yated in the spring of 2006 in which R. Y. Belsky stated that even purely vocal acapella recording is now considered music and assur. This is because it is digitally mastered with imperfections removed and thus becomes a recording, performed by an instrument and included in the issur of music. If so, this should certainly be forbidden. On the other hand, if you accept the equating of digitally mastered acapella with recorded vocal music and permit recordings of acapella singing, as has become customary, this should also be perfectly muttar. Here is a rationale as to why. The source for the distinction between instrumental and vocal music is the gemara in Gittin 7a about mourning for the Mikdash. From the verse "Don't drink wine with song" (Yishayahu 24:9) we learn that instrumental music is forbidden; from the additional verse "Israel, don't rejoice unto delight like the nations" (Hoshea 9:1) we learn that vocal music is also forbidden. From the order in which the two sources are presented we can learn that there is a greater stricture for instrumental music. And according to Rashi there is also a practical distinction, in that vocal music is only forbidden in a wine house whereas instrumental music is forbidden in general. This implies that instrumental music is forbidden because it is associated with celebrations, not because it is :music" per se. A later source which reinforces this impression is the statement of the Maharil that it is improper to make a wedding without musical instruments, for these are the main way we gladden the bride and groom (Maharil Eiruvei Chatzeirot). A reasonable conclusion would be that in our time, when recorded music is not only associated with celebration, even it should be permitted. However, Tzitz Eliezer15:33 seems to feel that the association is still sufficiently strong that recorded music remains forbidden and such is the common practice. How does this relate to vocal music that is digitally mastered to sound like instruments? Would there be an issue with Kol Isha in such a type of music? It would seem to me, lehalacha if not lmaase, that this brand of vocal music that sounds exactly like instrumental recordings, is associated with celebrations and that it should remain forbidden on sefira. On the other hand, kol isha would depend on the strength of association with a woman's voice. There are poskim, M'archei Lev, for example, who permit kol isha (although stating that it is still a dovor mekuar) if the voice is not associated with an image and one does not know the identity of the singer. I recall that a few years ago there was a very high alto yeshiva bochur who put out a CD in Israel who sounded just like a woman. Chareidi radio stations played it for some time but ultimately were forced to "pull it " because of listeners' complaints. Such is the power of association. The Mishna in Sota(3a) includes the Shma in the list of those declarations that can be said on any language. In fact, there is a disgreement between Rabbi and “Rabbanan” about this fact. I quote:” ‘The Shma(must be said) as it is written(Rashi -in the Holy Tongue)’- the words of Rabbi. The Sages say:”in any language”.What is the reasoning of Rabbi? It states: ...and these words shall be... As they are, they should be.And the Sages, what is their reasoning? Hear, O Israel-in any language that you understand.’ ”(Brachot 13a). Despite this unambigous source, the Rif is quoted by Beit Yosef (Orach Chaim 63) as proscribing recitation of the Shma in languages other than Hebrew based on a passage in Shabat 12a where R.Yochanan states:” A person should not ask his needs in the Aramaic language for the angels (who carry the prayers ) do not understand Aramaic. This version of the Rif clearly implies that the Shema is a type pf prayer. Only if it is a prayer would the passage in Shabbos apply to it. The Beit Yosef objects that the recitation of the Shma is in no way “asking his needs”, meaning that it si not a parayer and should not be restricted by the statemetn of R. Yochanon. I do not believe that the Beit Yosef disagrees with the premise that the Shema can be viewed as a form of prayer for he himself writeds in Orach Chaim 57 that” the words of the Shma are words of Prayer". A prefferable explanation of the Beit Yosef’d position relies on the distinction between communal and private aspect of prayer. The Rosh in Brachot(Ch.2,2) restates the problem that occupied many of his predecessors in relation to the above quoted passage in the tractate Shabbat. The women in Ashkenaz were not in the habit of attending public prayers and many of them did not know Hebrew. They prayed at home and in the vernacular. This practice appears to contradict what we just read from tractate Shabbos, for prayer in other languages should not be permitted to anyone, men of women. The justification offered by many Rishonim was that women’s prayers are 'formal', of a specific text, and thus analogous to those of the public and are acceptable in any language. Only those prayers that are completely original and individual are included in the statement of R. Yochanan..
We see, however, from this issue that the mainstream position is to accept the Shema as being to at least some extent and for at least ceratain purposes a form of prayer. It is less clear what kind of prayer it may be, as it does not fit neasily into conventional framework of supplication, praise or thanksgiving. The Beit Yosef certainly appears to posit that its character is that of a of communal prayer. That would make sense if we define prayer Ias being not only a personl but also a communal and formal rite. If so, any text that is accepted by teh community to be used in formal apryers is simply "prayer", even if it has nothing to do with personal conversation between GOd and man. If so, such parayer is not limited by restrictions that apply to original and individual prayers and can be recited in any language. One need not , however, go as far as to see the Shma as only formal in origin, for we know from common practice that it is as much a communal as a private prayer. Rather, the communal element is another strand in the multifaceted nature of this basic and unifying prayer. The disagreement appeats to be about the meaning of the word “Shma” as used in this verse. The root S’MA is used in the Tanach to sometimes mean “understand”or “accept” and sometimes to “hear” or “listen”. Both meanings are nicely presented in Rashi to Genesis 33,27. See also Sipporno . Our text in the Rif does not appear to bear out this version of his position. Tosafot Brachot 45b sv Sheani. This can be best explained by the principle espoused by Rav Y.D> Sooloveitchik based on his explanation of Berakhot 29b ck in Kavana in prayer. To paraphrase him, an insignificant, lowly, sinful individual has no right to approach his Creator alone but only as a member of the community. It is for this reason that all our prayers are phrased in plural. The Rav said that the Gomel blessing represents the only exception to this rule(but see Siddur Chazon Ovadia, beginning note 69) and that only because it includes the phrase”...who has dealt kindness to the sinners”. As noted in Magen Avrahm 219,1 no one has a right to call others sinners while standing before G-d in prayer. This is why we phrase this blessing in singular even if the intent is still for plural. The Jews have produced a rich and varied literature during the second Temple period. Most of these works, termed Apocrypha and Pseudoepigrapha, have been purposefully excluded from the Jewish Scriptural canon for various reasons. Some of them reflect non-traditional views and they were forbidden to be read and studied for this reason. Others, such as Wisdom of Solomon and Maccabbees are cited on occasion by Rishonim and Ben Sira is treated by the Talmud as containing important and true teachings. Presumably these ones were rejected because they were not written with Ruach Hakodesh. In addition, in our own day, we became aware of clearly sectarian writings, such as the Dead Sea Scrolls. These writings are certainly not Torah but they can on occasion shed light on obscure Midrashic passages. They do so by either preserving the same tradition that the later midrashim cite, demonstrating ancient origin of many Midrashic interpretation, but also by helping identify interpretive issues. Consulting these works can often clarify or explain why Midrash pursues one explanation rather than another. In the latter cases, Midrashic writers may have been aware that a sectarian teaching may stem from a particular interpretation and have taken steps to provide us with a different explanation. You shall surely rebuke your neighbor and you shall not bear sin over him (Lev. 19, 17). There are a host of exegetical issues in this verse and anyone writing about this verse must take them into account. For our purposes let us focus solely on one issue. Why does one who does not reproach bear sin? What is this sin and who incurs it? Who is the verse focused on - the sinner who is being rebuked or the one who administers the rebuke? The context of surrounding verses, all of which are in 2nd person argues that the sin is that of the rebuker; however, it is also possible that it is of the person being rebuked for whom the rebuker than bears responsibility. The first one to tackle this issues appears to be Ben Sira who writes: "Reproach a friend before getting angry secretly. ..it is better to reproach than to be angry (20:2)" He seems to understand the verse in Leviticus as teaching us that hate hidden deeply inside the heart leads to anger and to other transgressions. The sin is that of internalized anger and it is of the rebuker. He must administer rebuke or else he will grow angry, which is itself a grevious transgression. This interpretation assumes that holding back from reproach leads to the sin of anger. Its weakness is that this rebuke is ultimately self-serving, solely for rebuker's own benefit, so as not to be angry, and not at all to benefit his neighbor. That is not the sense that one gets from reading this verse in context, including the famous "Love your neighbor as yourself". The context seems to be focused on the neighbor, not the person who interacts with him. All other exhortations are focused precisely on benefiting the neighbor and not yourself. Testament of Gad, a pseudoepigraphical part of the Testament of the 12 Patriarchs, interprets the connection between the beginning and end of the verse somewhat differently. The sin that you must avoid is the one that your brother may fall into if you rebuke him improperly. Love one another from the heart and if anyone sins against you, speak to him peacefully, having banished the sin of hatred and do not maintain treachery in your heart... If he listen to you, you have gained a brother. If he denies, do not dispute with him, lest he swear and you thereby sin doubly (6:3-4). This is weak as well for it is difficult to understand what the purpose of the rebuke really is. If hatred is already banished from the heart, what purpose does rebuke serve and what does it accomplish? In fact, why do so if the only thing that is likely to result from administering rebuke is that your brother be led into more sin, the exhortation not to dispute notwithstanding. Besides, why should the rebuker care about someone's else sin, especially being that he himself is doing the right thing by administering the rebuke. Thus, Ben Sira explains the sin as that of anger into which the reproacher will otherwise fall while Testament of Gad explains it as that of the person being rebuked, who through proper rebuke may confess and make peace but with improper kind of rebuke, may be led into additional sins. Both explanations are weak. The Sifra offers the following explanation. Do not hate your brother in your heart. You might think you should not hit him, curse him, slap him (to make rebuke successful). It says, 'in your heart', the only thing prohibited is hating him in your heart (but slapping, cursing and hitting are OK). This interpretation is clearly the opposite of that of the Testament of Gad. How do you know that if you rebuke him 4 or 5 times (and do not accomplish), that you continue to rebuke him. It says: "You shall surely rebuke". The Sifra appears to hold the purpose of the rebuke is for the "neighbor" to repent. Pressure in the form of hitting, if needed, slapping, and cursing is a part of successful rebuke. The purpose is to benefit the indivudal who is being rebuked by bringing him or her to repentance. Are there limits to how rebuke can be administered, as Testament of Gad claims? You may think even if his face changes, "It says and you shall not incur a sin over him". Thus, only as much pressure as is required to bring about repentance is allowed but no more. It is not permitted to cause him emotional pain, even if that would accomplish repentance. That would be a sin and the rebuker is warned to avoid it. It is obviously quite difficult for anyone to forcefully escalate rebuke but stop just short of emotional damage. R. Tarfon said: by Divine Service, if there is anyone in this generation who knows how to administer rebuke. R. Elazar Ben Azaria said: By Divine Service, if there is anyone in this generation who knows how to receive rebuke. R. Akiva said: By Divine Service, if there is anyone in this generation who knows how rebuke is given. R. Yochanan ben Zakkai said: I bring Heaven and Earth into witness that that R. Akiva was flogged more than 4 and 5 times through me by R. Gamliel, that I complained about him, so much was I certain that he would love me even more. The Sifra's explanation keeps a proper balance between concern for one's neighbor and one's own proper spiritual welfare. Unlike the explanations offered by non-canonical writings, it is consistent with the context by keeping the focus on the rebuked person, the one referred to throughout the surrounding verses as "broterh, neighbor and the like". In this it is a much superior explanation on the level of pshat. Consideration of how non-canonical works handled exegetical concerns in this case enables us to throw the Midrashic comments into sharper relief and to appreciate how Tannaim offered a more comprehensive, more satisfying, and therefore more "true" interpretation than their contemporaries who did not have access to or rejected the Oral Law. 1 Works that were a part of the Septuagint and consequently of Vulgate and accepted as canonical by the Catholic Church. 2 Works attributed to Bibilcal characters and preserved by Eastern or Ehtiopian Churches in Amharic, Slavonic or Syriac versions. 3 An example is the book of Susanna which casts aspersion on the "elders" and also portrays the process of cross examination that is against halakha (contradictions in testimony revealed by cross examination of bedikos are ground for applying the law of premeditated false witness (zomamim), sig. Professor Sid Leiman. I suggest a dsicussion with somewhat different focus on the Christian use of these writing in his Mvo Letorah SHebiksav ihseabbal Peh. 4 Cited by Ramban in the Introduction to his Torah commentary. 8 The use of terms 'brother' and 'neighbor' supports the contention that both these passages have the Leviticus passage in mind. 9 The Ramban ad. loc. offers an explanation that incorporates both these ideas. 10 This statement of R, Akiva appears to be a reaction to the disagreement between RT. Tarfon and R. Eliezer. R. Akiva notes that the two Sages disagree about rebuke and points out the obvious fact that there is no one in his generation who understands the parameters of giving rebuke. Hotsa'at ha-Histadrut ha-Tsiyonit ha-Ahidah ve-'Nahem' be-Germaniah, [Munich]: . In 1946, the survivors of the holocaust celebrated their first Passover just a few months after their own captivity. While there was an abundance of traditional haggadot imported from Israel and the U.S., the times were extraordinary and called for something different. With the horrors of the holocaust fresh in their memories, the survivors could much more easily relate to their own exodus. Furthermore, the suffering under the Nazis surely must have eclipsed that under the Egyptians. This environment resulted in this most unusual Haggadah which concerns itself with the contemporary version of Egypt. For example, Sheinzon's refashioned "dayenu" recalls all the major calamities that befell Diaspora Jewry, culminates with the holocaust, and ends with the statement: "Since all these have befallen us, we must make Aliyah..., build the chosen land, and make a home for ourselves." 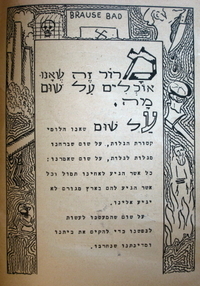 The present Haggadah, the first published in post-holocaust Germany, is thus one of the most unique and historically significant of all haggadot. The Jewish Publication Society and The American Jewish Historical Society each recently published a facsimile edition of this Haggadah. 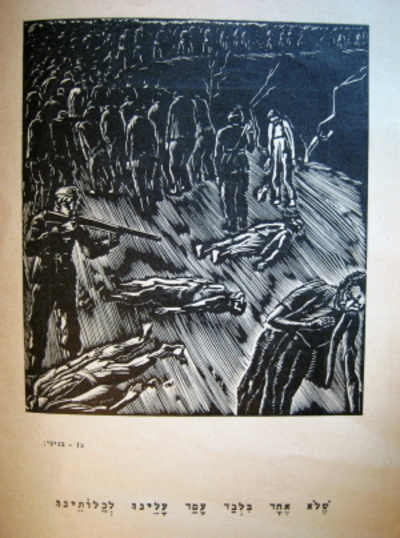 JPS's description relates that "for five decades this unique book was all but forgotten" and was only recently discovered in an attic. 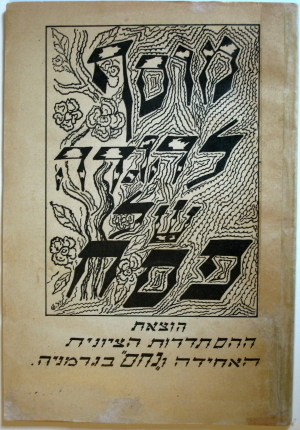 This work was reprinted in the same year by the U.S. Army and was used for a communal seder in Munich in 1946 (Touster xxvi). The Tamid ascrifice according to its orders and musaf scrifices according to their laws (Musaf Prayer). over them, to merit the reward. many halachos - because the Korban Musaf for every occasion is different. other korban. That is also why we mention tamidim first, even though they are not specifically Yom tov related, because they precede every other korban. In the world without limitations and distinctions, everything is possible. A Russian Jewish band is mixing classic Yiddish tunes with heavy metal. In 2006 Gevolt had recorded their debut album "SIDUR". A quote:"Dark, Cold, Mysterious and Daring. This Ritual Metal album delivers you the most somber atmospheres, beautiful but eerie melodies, layered walls of hi-tech sounds, aggressive guitars and theatrical passionate performance." This makes me think. Is this intermixing, mongrelization, interweaving of opposites that is all around us a good or bad thing? Are we wtinessing a breakdown of boundaries that desecrates all that is sacred, kelipos swallowing up the holy sparks? Or is this an expression of the approaching Redemption, birur and revelation? This is what Mordeschai Sheinfeld in The Forward thinks: "Gevolt’s affinity for this style of music is, on one level, shocking. Rammstein, the NDH scene’s best-known band, has courted controversy by toying with fascist imagery (such as using excerpts from a Leni Riefenstahl film during one of its videos). But it is the dichotomy between the militaristic NDH sounds and the sincere intonations of “Tum Balalaika” that elevates Gevolt’s music above a cheap novelty act (metal and Yiddish!) and makes it a musical phenomenon that merits attention. They are singing Yiddish even as they defiantly borrow from a musical style that occasionally evokes the very movement that destroyed Yiddish culture in Europe. But Gevolt’s music is not auto-annihilation rock. Rather, it is a resurrection. Their composition of Hirsch Glick’s famed partisan song “Zog Nit Keyn Mol, Az Du Geyst Dem Letsten Veg” (“Never say that you are on the final road”) is stunning in both its lyrical beauty (Glick’s contribution) and its musical defiance (singer Anatholy Bonder’s contribution). When the metal disappears momentarily and band member Marina Klionsky’s klezmer-inflected violin plays softly, one begins to reconsider Singer’s statement. Even as those for whom Yiddish was literally a mother tongue pass away, the mameloshn remains a language of cultural power and resonance. Gevolt aren’t singing nostalgia tunes — they’ve done nothing less than shaken Yiddish back to life."